Last month’s entry took us to a green space in the middle of a large U.S. city. For this month’s feature, we remain in the U.S. but get closer to nature. 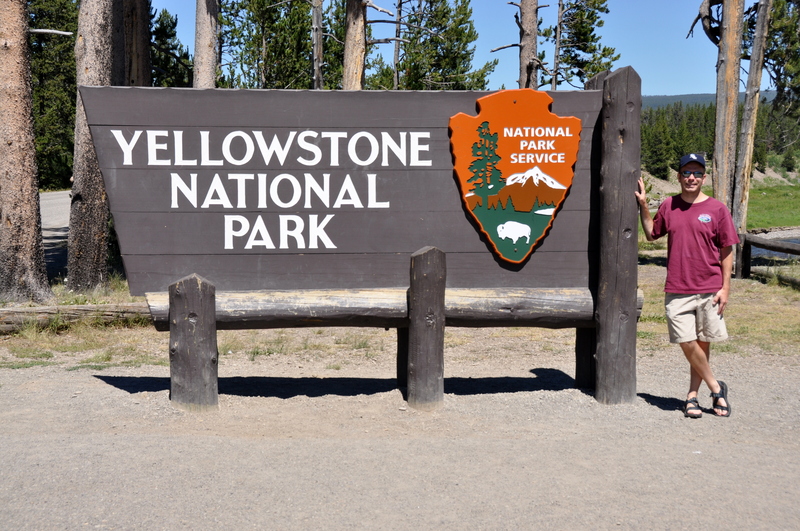 Yellowstone National Park is the country’s oldest national park. It is also one of the biggest, occupying the northwest corner of Wyoming as well as several thousand acres in both Idaho and Montana. My only visit to the park was in July of 2010. 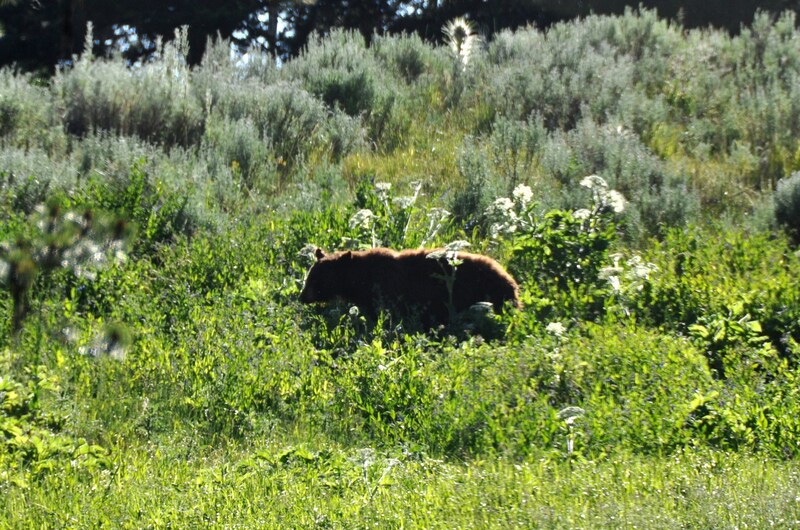 I flew into Jackson Hole, Wyoming (JAC) and spent an equal amount of time in Yellowstone and in Grand Teton National Park – another lovely place. 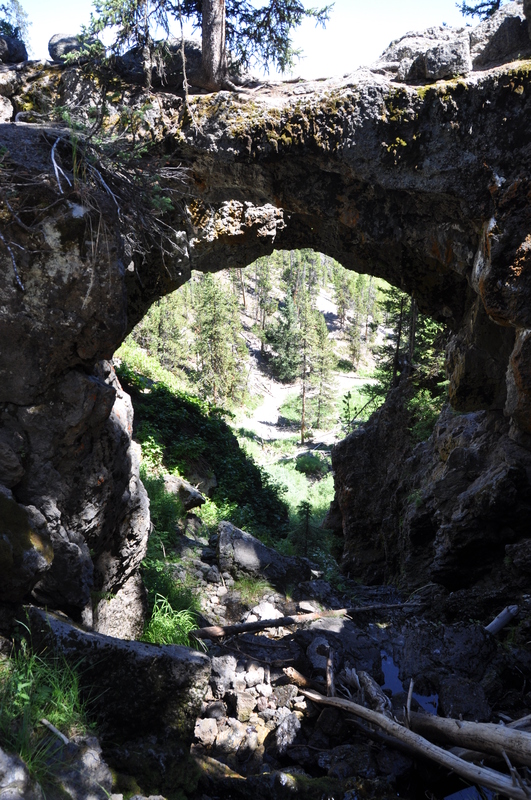 The above pic is the view that greets you soon after entering Yellowstone from the south. Neighboring Montana is often dubbed “Big Sky Country,” but I’d apply that moniker to this corner of Wyoming as well. The park is a haven for wildlife. The NPS has received acclaimed among conservationists for its successful reintroduction of gray wolves into the park, but you probably won’t see those reclusive hunters. 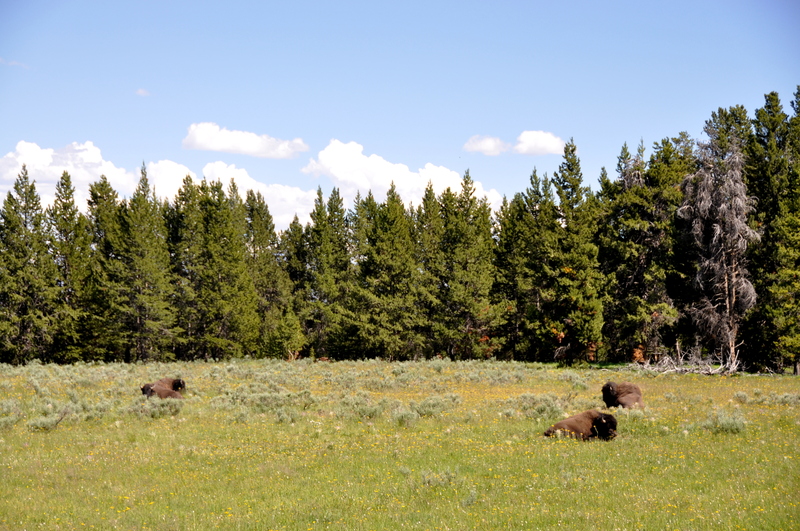 Much more commonly sighted are bison. Simply put, they’re everywhere! 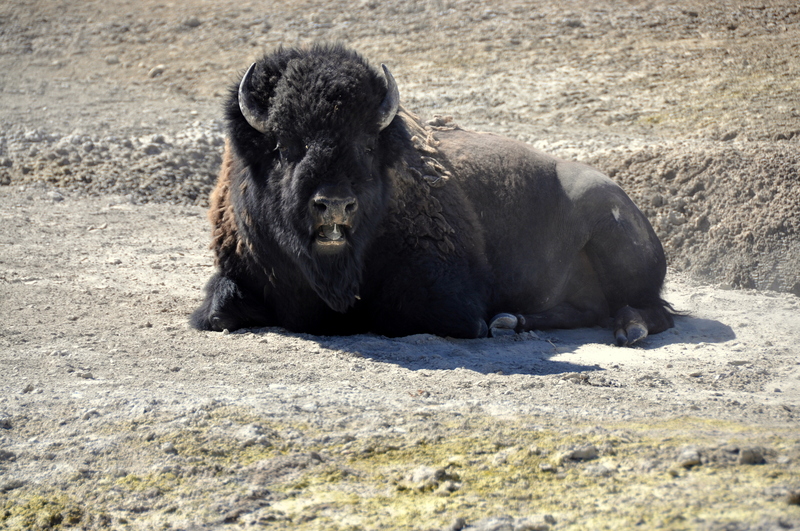 The bison in the above pic is sunning himself in the middle of one of Yellowstone’s many sulphur springs, and apparently doesn’t mind the steam, nor the rotten eggs smell. Bears – black and grizzly both – join the gray wolves as the park’s most-feared, least-seen beasts. I didn’t spot any grizzlies but drove past this berry-picking Ursus americanus, who was blissfully unaware of myself and the dozens of other shutterbugs snapping away at him despite the bad light. Some predator, eh? 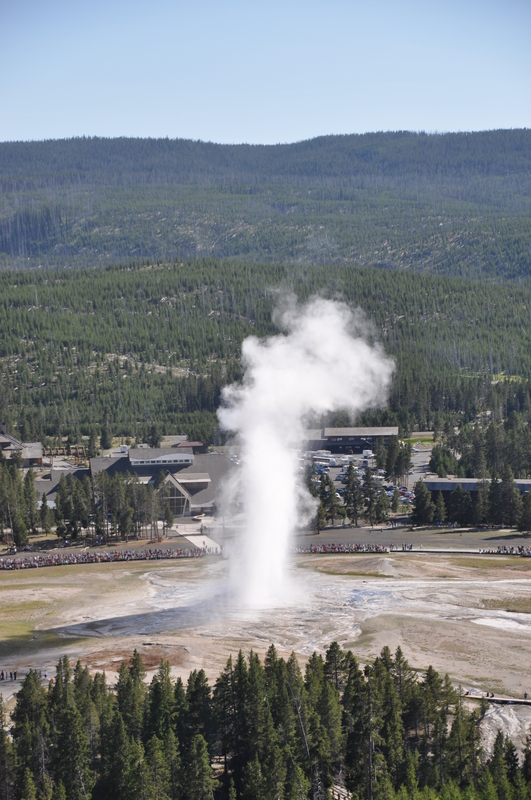 Without a doubt, the star attraction of Yellowstone National Park is Old Faithful, that reliable, centuries-old geyser. 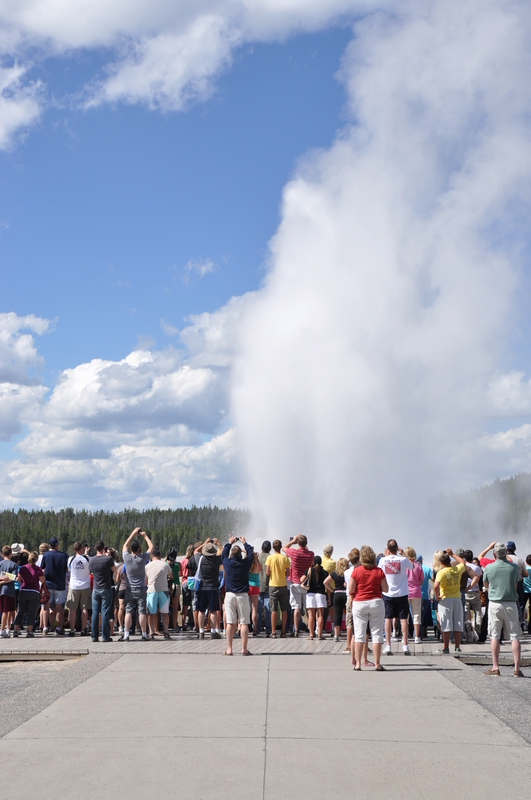 Old Faithful erupts three times an hour, regular as clockwork, and attracts hordes of visitors. The viewing area numbers seemingly rank up there with the grandstands at the annual Macy’s Thanksgiving Day Parade. The eruption is much more impressive when seen from above. Several other, “lesser” geysers can be seen up close from a nearby boardwalk. The hotel in the background is the Old Faithful Inn. A night’s stay was out of this backpacker’s budget, but I did peek inside the lobby. 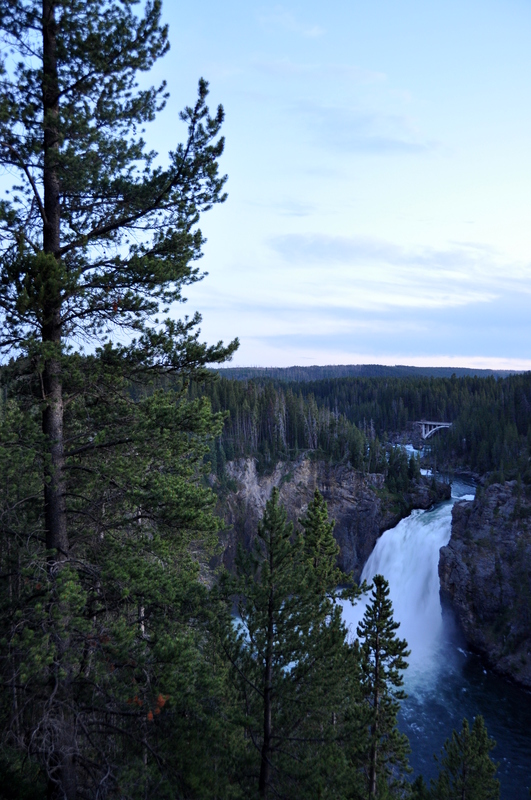 Another park wonder to draw crowds is the winding, gorge-like series of Yellowstone River waterfalls collectively known as the Grand Canyon of the Yellowstone. At least one-half dozen turnouts and paved trails offer excellent viewpoints of the raging river cascades. 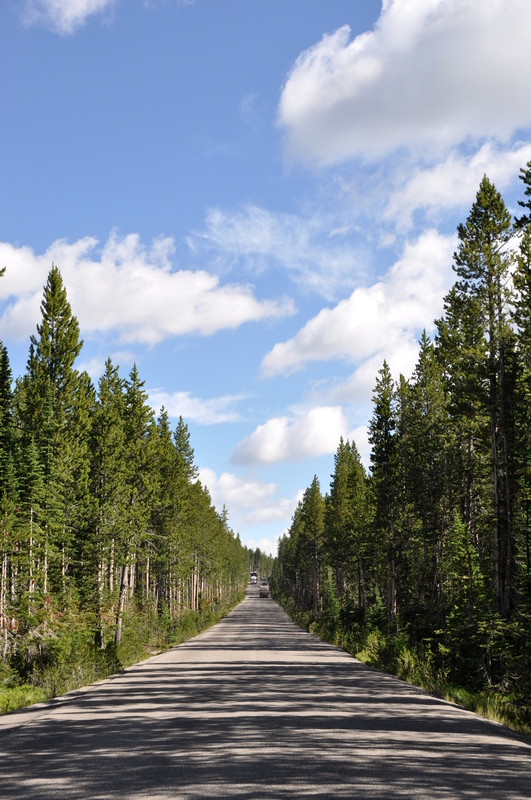 It is a long drive from Jackson Hole to the Grand Canyon of the Yellowstone. 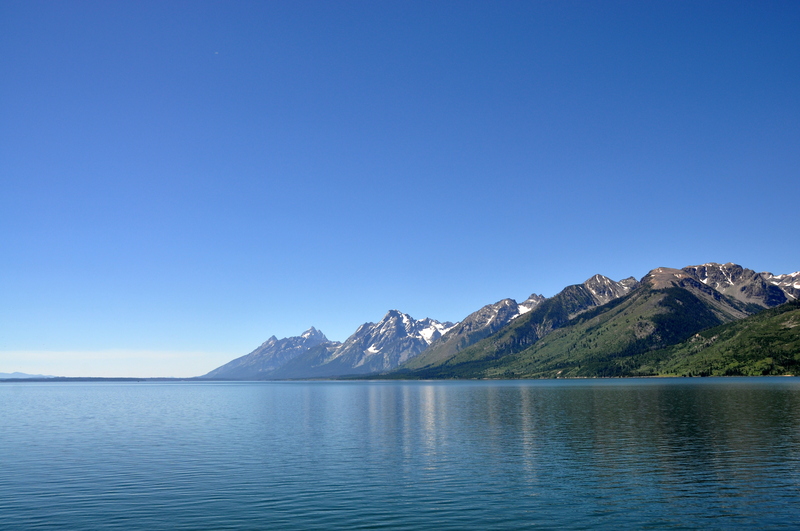 Midway on the journey, the road passes Jackson Lake, which offers a jaw-dropping view of the Teton Range. This picture received no editing, and looks rather like a painting, does it not? Even bigger than Jackson Lake is Yellowstone Lake. I happened to drive past during a full moon, and set up my tripod for this capture. 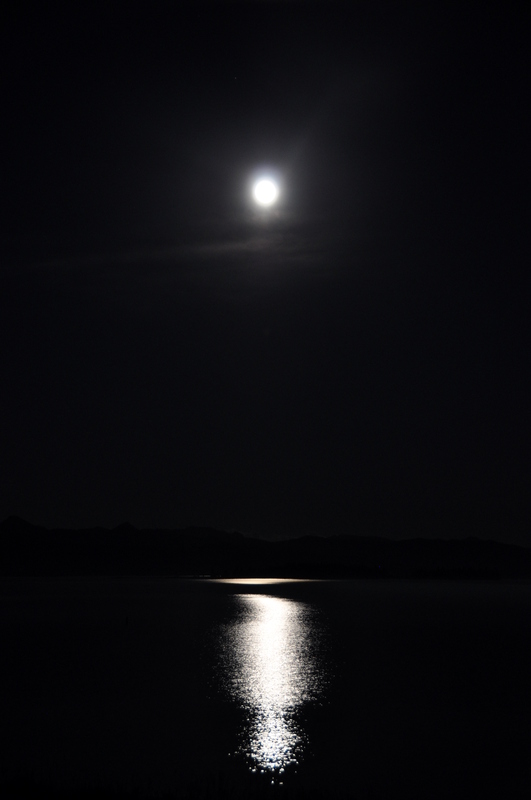 I couldn’t capture the moon’s pock-marked details even on “Manual” mode, but I like the composition and reflection. The park roads pass the Continental Divide at least twice. All rivers east of the Divide drain into the Atlantic, and all rivers west of the Divide drain into the Pacific. 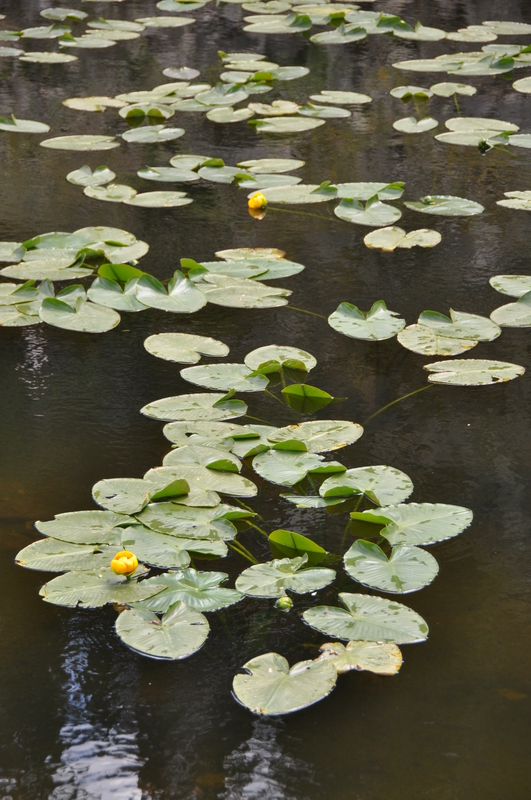 The above lily pond, just a stone’s throw from one of the signposts denoting the Divide, was a nice discovery. 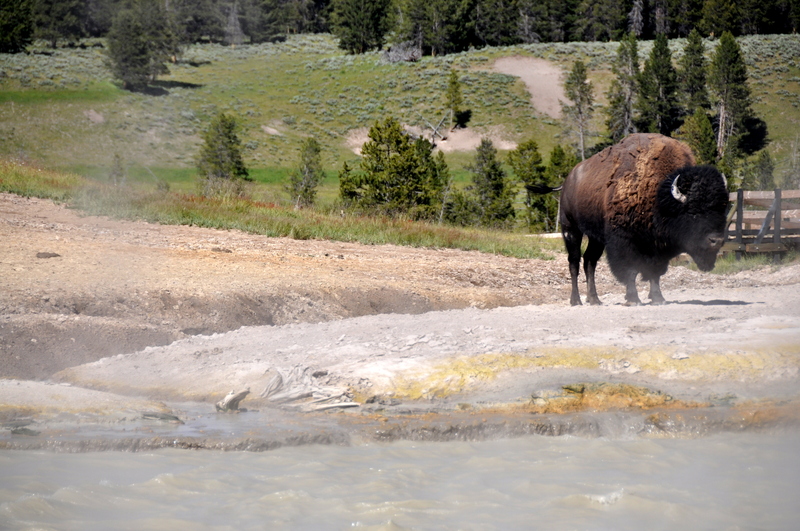 You surely won’t see all that Yellowstone has to offer on a single visit, and may have to pick-and-choose. I didn’t make it to the ethereal, Grand Prismatic Hot Spring, or to the petrified rock forests of the park’s northern periphery, but I did see some unexpected sights, such as the natural rock bridge pictured above. 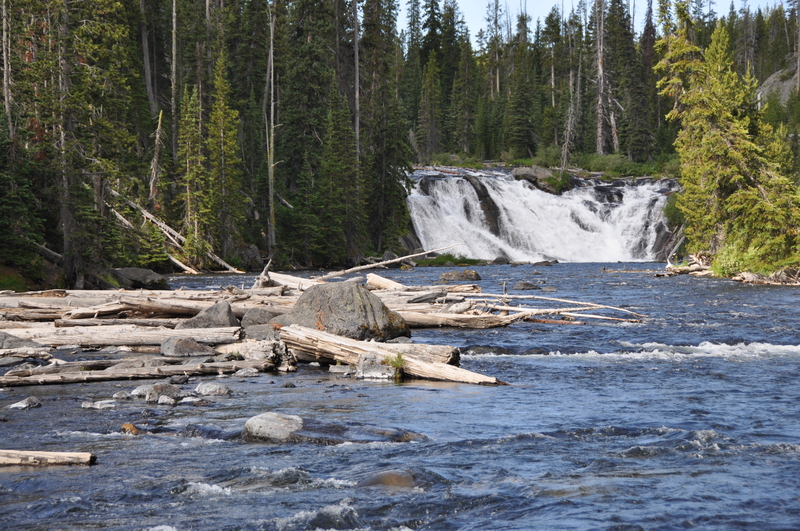 Other wonders, like 30-foot Lewis Falls, are just a short walk from the road. I saw four moose during my visit! 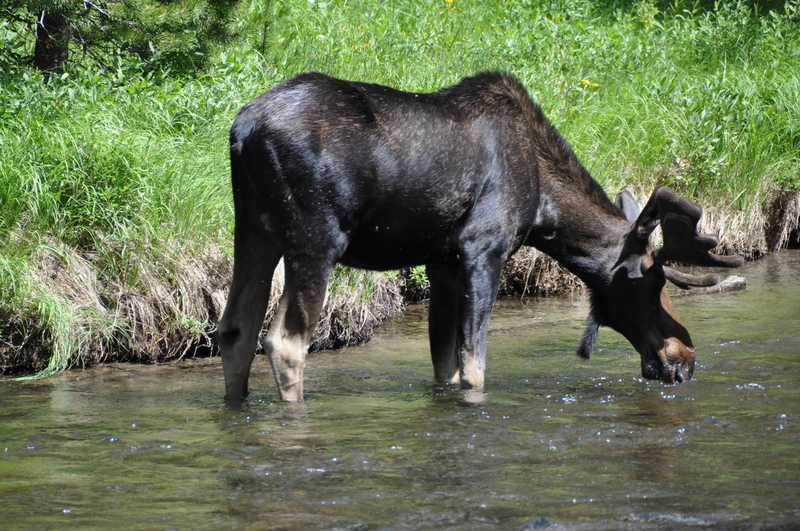 Three were spotted from a distance, but this thirsty fellow was wading, trail-side, near the aforementioned natural bridge. I watched him for perhaps 30 minutes…and had the experience all to myself. When communing with nature, always keep your eyes peeled. 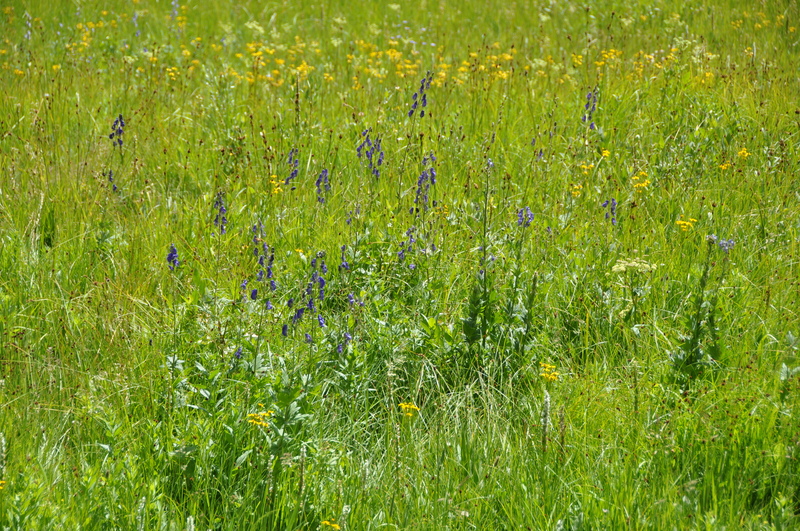 Snow-capped peaks, raging waterfalls, thermal springs, grazing wildlife, sub-alpine meadows…beauty is everywhere. I too have only been to Yellowstone once, and in a couple days I was only able to see the highlights. On the same trip I went to the Tetons. Unfortunately forest fires that summer made the view of those magnificent peaks less than picture postcard perfect. I think Yellowstone is bigger than the state of Rhode Island! I’d love to go back. To the Tetons, too. Great hiking there.